Apple CEO Tim Cook will be making another trip to China in March to co-chair the China Development Forum, an event where business leaders meet with officials from the country's government, with Cook likely to use the opportunity to improve Apple's relations with the country's leadership and to attract more customers from the region. The China Development Forum is an annual conference sponsored by the Chinese government, usually attended by the heads of western corporations seeking to improve their position in relation to the Chinese central government. The event provides an opportunity for organizations to speak to government officials, with a western business leader co-chairing with a high-ranking government member. The Wall Street Journal reports Cook will be taking the role of co-chair, following after former Ford CEO Mark Fields and former Caterpillar CEO Doug Oberhelman. Though the forum's chair has yet to be announced, it is reportedly a custom that the minister of China's State Council Development Research Center takes the seat. For last year's event, Cook took to the stage for an hour-long address, promoting globalization as "great for the world," while also noting socioeconomic gains are not necessarily evenly distributed between countries. Cook's speech also covered cybersecurity and user privacy, sensitive issues in a country that actively censors content and monitors its citizen's online activities for signs of dissent. Apple is currently in the process of migrating iCloud data for users based in China to local servers, including the cryptographic iCloud account keys for the first time, to comply with Chinese cybersecurity laws. While Apple's security protocols involve encrypting data transfers to and from user devices, as well as data stored on the cloud, human rights activists have voiced concern over the change, suggesting the migration will leave the data vulnerable to surveillance by the authorities. 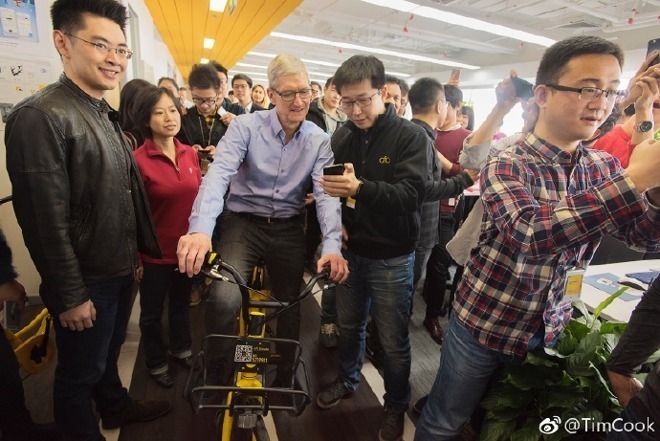 This will also reportedly be the fifth visit to a major event in China by Cook in just over a year, as Apple continues to increase its reach in one of the largest smartphone markets in the world. In January, it was revealed the iPhone X managed to acquire 6 percent of the market in urban China, putting Apple ahead of local vendors like Huawei and Xiaomi. Cook's attempts to ingratiate the company with the Chinese government has come under fire, with Florida Senator Marco Rubio attacking Apple in December last year for bending to the will of the country's lawmakers. Rubio accused the company of hypocrisy, calling the company "so desperate to have access to the Chinese marketplace that they are willing to follow the laws of that country, even if those laws run counter to what those companies' own standards are supposed to be."